Heat oil in an exceedingly five 1/2- to 6-quart wide, serious pot over medium. Stir in onion and fennel; cook, stirring often, till soft (11-12 minutes). Stir in garlic, bay leaf, oregano, and crushed red pepper; cook, stirring, till sweet-smelling (2 minutes). Add wine, water or clam juice-water dance orchestra, and tomatoes. bring around a simmer; cook, lined (20 minutes). Stir in mussels, pollock, and shrimp. bring around a simmer over high heat, uncovered (2 minutes). Add squid, if using, cover pot, and cook until mussels open wide and food is opaque and simply burned through (about five minutes more). (Discard mussels that don't open.) Serve. 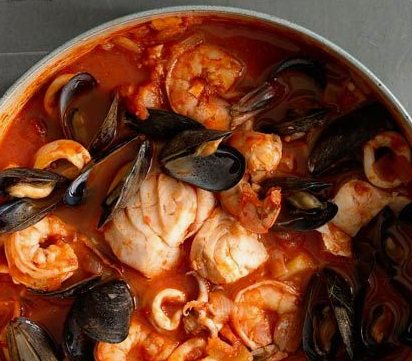 0 Response to "Cioppino (San Francisco style fish stew)"